It’s not hard to come up with three reasons golfers are drawn to Falcon Ridge Golf Club in Lenexa: Location, design and service. That’s the way Regional Director and General Manager Steve Price sees it. Those attributes, along with Falcon Ridge now being part of the family of GreatLIFE golf courses, help explain why more balls are flying off the tee there. “This place is as busy as I have ever seen it,” Price said. “It’s a very positive experience.” Price has been with Falcon Ridge for four years and is a PGA professional. Falcon Ridge is among four courses in the Great Life Classic Plus category, along with Deer Creek, Prairie Highlands and Hillcrest. For $179.99 plus tax, including cart, members can play the other three courses plus nine others in two lower tiers. Falcon Ridge joined the GreatLIFE Golf & Fitness group in March of 2016. Falcon Ridge is just a couple minutes north of Kansas Highway 10 at the Woodland Road exit and very close to the I-35 and I-435 interchange. Few courses in the area are so easily accessible. The course has long been appreciated for its championship-caliber design, with no two holes alike as golfers navigate undulations, bunkers and water hazards over the par 72 layout. The course offers generally wide fairways. The first hole is a confidence-building par 4 that is relatively short and flat. The second hole par 4 is similarly manageable, but water on the right can gobble up a too-long drive or poor second shot. The course gets tougher in a hurry as a tee shot on 3 that is slightly left can bound into the rough and creek that line the fairway on the Par 4 hole. The course continues to mix challenging holes with relative breathers while always giving players a good view of landing areas off the tee and few blind shots from the fairway. Falcon Ridge is unusual in that it has five par 5s and five par 3s. There is a stretch of seven holes on the back with only one par 4. Falcon Ridge does not have an abundance of trees, which gives the fairways and greens plenty of sun and air conducive to healthy grass, Price said. “It’s always been well-maintained,” he added. 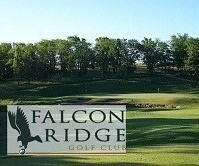 Falcon Ridge has leagues and tournaments, detailed on its website, falconridgegolf.com. Its green fees are very competitive, including senior rates of just $36 plus tax during the week for players 55 and older. Lessons at Falcon Ridge are overseen by Courtney Mahon, the new director of instruction. She returned to her home state of Kansas this year after serving as lead instructor for the Tour Striker Golf Academy in Phoenix. She is an LPGA professional. Falcon Ridge has a full bar and grill menu and a popular Taco Tuesday night. Its banquet room hosts golf events, parties and receptions. Falcon Ridge remains a public club but may become private before long. The course has signed up about 300 members and plans to go private when it reaches 400, Price said. Weekend golf tourneys are being phased out and events will be confined to Monday through Thursday, once the course has 400 members he said. Memberships run from April 1 to March 31. GreatLIFE has also set 400 as the private membership threshold at its other three Classic Plus clubs, Price said. Members can play all four courses any time and can play the 13 courses at the Classic and Champion levels anytime except before noon on Saturday and Sunday. When the clubs go private, members will be allowed to bring guests. Membership at a GreatLIFE course also provides access to fitness centers at five of the 13 clubs, something that is especially attractive to families, Price said. “The whole idea behind GreatLIFE is to enrich the lives of families and individuals through golf, fitness and healthy lifestyles – for individuals, couples or the whole family.” Price said. GreatLIFE also has its own citywide junior golf program to stimulate more interest in the game, he said. Besides a winning design and favorable location, Falcon Ridge strives to bring golfers back through positive interaction at the front counter, in the pro shop, on the practice tee and in the dining area. “We back everything up with the best service we can give,” Price said. Tee times and more information about Falcon Ridge can be found on its website or by calling the pro shop at 913-393-GOLF (4653). Now that the 2017 golf season is upon us, the time has come to kick your game into high-gear. Before doing so, consider revisiting a few fundamentals to give yourself the best chance of success on the course this year. A typical golf bag is comprised of somewhere around 75% irons. On any given hole, the average golfer is nearly guaranteed to hit at least one iron shot. The caliber of irons you put in your bag are, therefore, worth considering. Your ball-striking ability is a crucial component to your overall craft as a golfer, and like any craftsman knows, you are nothing without your tools. The article below outlines six new iron sets introduced this year in what many call the “Players” category – meaning single-digit handicaps would be the typical target audience for this lineup. Learn why the best of the best put their trust in these irons and why you should too. Whether you’re a scratch golfer or a 20+ handicapper, your irons should provide an aesthetic that’s pleasing to the eye. Callaway built their Apex Pro irons with an artist’s touch, ensuring eye-catching appeal for golfers of all skill levels. More importantly, Callaway addressed the playability of their new irons by focusing on three specific components: feel, precision, and customization. The Apex Pros are made from 1025 mild carbon steel and advanced quadruple net forging, which creates the soft feel off the face that players prefer. The multi-material design optimizes each club’s center of gravity (CG). 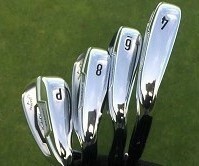 The longer irons (3-5) are more offset, with a tungsten insert that lowers CG for higher launch. The shorter irons (6-wedges) have a higher CG for a controlled, penetrating trajectory, further optimizing their playability. For added customization, these irons are offered with a wide selection of steel shaft options at no upcharge. Speak with your local pro to decide on a shaft best suited for your style of play. The Cobra King Forged Tour Irons offer superior feel, accuracy, and consistency for the better player. Cobra also focused their attention on club-face center of gravity to ensure consistent shot-making. Strategically placed tungsten inserts in the heel and toe position put the center of gravity directly behind the impact zone on the club face for consistent distance and trajectory control. Consistency is key when it comes to improving your game. Cobra also understands that feel, like club aesthetics, is a lesser known component that most players deem important. A Thermoplastic Polyurethane insert located behind the hitting zone on the club head medallion damps vibrations and improves feel like a muscle-back iron. Consistent shot-making is half the battle. Getting your ball to stop on a dime, or release into an uphill hole-location is also crucial. CNC milling on the club face improves groove & face structures to deliver maximum spin control. The critique on TaylorMade irons in recent years has been the lack of Tour-caliber technology being introduced. TaylorMade answered their critics with their P770 irons, which received nearly 5 stars in the innovation/performance category. This innovative technology utilized an advanced forging process, which not only improves performance, but (like the Callaway Apex irons) offers more of an eye-catching aesthetic. The precision-milled faces and grooves offer that solid feeling off the club face that instantly turns a terrible round into something of beauty. Get used to the “sweet spot” feeling, because the club face offers phenomenal forgiveness. When creating the P770 irons, TaylorMade wanted to offer a club fit for Tour players and amateurs alike. They specifically focused on two components: technology to optimize ball speed consistency (thus enhancing forgiveness) and a lower center of gravity (which creates a higher launch angle compared to older TaylorMade models). The result is a high-performance iron with improved ball-striking forgiveness and a memorable feel for players of varying skill levels. The Mizuno MP-25 Irons are my top pick in the category of Innovation for 2017. These irons are made from boron-infused carbon steel, which is more durable than traditional steel. Furthermore, the boron allows for a thinner clubface and a slot behind the face that provides additional ball speed. In order to activate the boron, Mizuno designers added a micro-slot to the club face, which gives the club added flex for improved distance. I’ve seen these referred to as a suped-up version of traditional blades. What does this mean for you? Improved shot-shaping abilities and distance without compromising forgiveness. If transitioning from an outdated set to new irons scares you, the Mizuno MP-25 irons may be the first set you consider. The clubs use traditional lofts, which regulates the distance gap between clubs. You’ll therefore be able to gauge shot distances much more easily/efficiently. As someone who grew up playing Mizuno Irons, I’m the first to recommend this brand. Mizuno consistently pushes the envelope in terms of innovation without compromising playability. Ping irons have been gaining more and more traction in recent years. Ping’s desire to offer forgiving irons at a great price is shown once again in their i200 irons. This new model has a smaller clubface compared to models from years prior. The weight saved from the smaller club face was redistributed to the hosel and toe areas of the club, which, amazingly, offers even better forgiveness compared to previous models. The i200 irons are crafted from stainless steel for optimum strength and durability. While some clubs focus on one or two factors, like distance and spin (for example), the Ping i200 irons aim to offer a happy medium among power, precision, and feel. Not only does the weight distribution (from the club face to the hosel/toe) offer better ball-striking, if you find yourself in the deep rough, you will have an easier time keeping the club square through impact. Ping also utilized a hydropearl chrome finish on the club faces to repel moisture for improved surface interaction and crisper shot-making abilities. Additionally, the irons are manufactured with a concealed soft elastomer insert that activates at impact, providing instant vibration damping for unprecedented feel off the club face.